A free-form shortbread crust is easy to make and a perfect place to start if you are either new to or afraid of pastry. It makes a sturdy yet tender base for the fresh fruit topping. 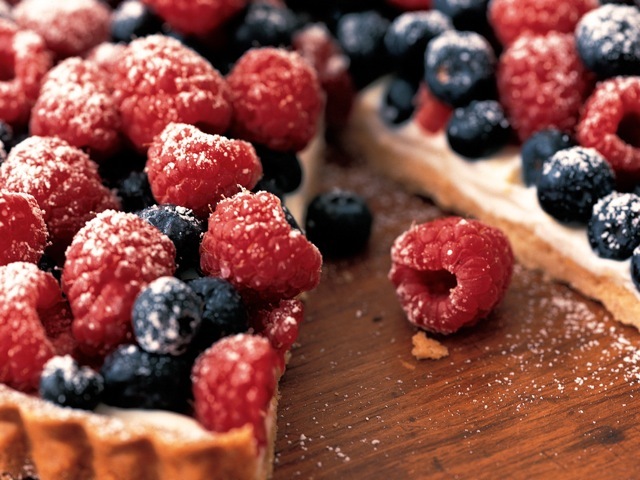 If you need to transport the tart before serving it, consider bringing the components (baked crust, mascarpone, and berries) separately and assembling it at the last minute. The crust can be made up to a week ahead. Wrap it airtight in foil and store at room temperature. Preheat the oven to 350 degrees, with the rack in the center position. Line a heavy-duty baking sheet with foil. Make the crust: Place the flour, salt, and brown sugar in the bowl of a food processor fitted with the metal blade. Pulse a few times to mix. Add the butter and almond extract to the work bowl and process for about 30 seconds, adding just enough water to make a soft dough. Gather the dough into a ball and place it on the baking sheet. Dust lightly with flour, then cover with a sheet of plastic wrap. Use the palms of your hands to press it into a 12-inch disk, with the edges slightly higher than the center (to contain the filling). Remove the plastic wrap. Bake for about 30 to 35 minutes, or until lightly browned. Allow the crust to cool on a wire rack before filling. Fill the tart: Mix the mascarpone, 3 tablespoons of the confectioners’ sugar, and the zest in a small bowl just to combine. Spread over the cooled crust. Scatter the berries over the filling, and just before serving, dust with confectioners’ sugar. This is a free-form tart. If you want the crust to be a precise circle, line a 12-inch springform pan with foil and press the dough into the bottom. Culinate editor's notes: You may find rolling out the dough, as with a traditional pie crust, to be easier than trying to press the dough into a 12-inch circle. And feel free to use stone fruits, such as peaches, plums, and nectarines, in addition to or in place of the berries; their flavor goes well with the almondy notes of the crust.